An institution’s curriculum architecture defines the essential components of its curricular system; maps the interrelationships between the components and the environment; and specifies the system’s intended learning and award outcomes. 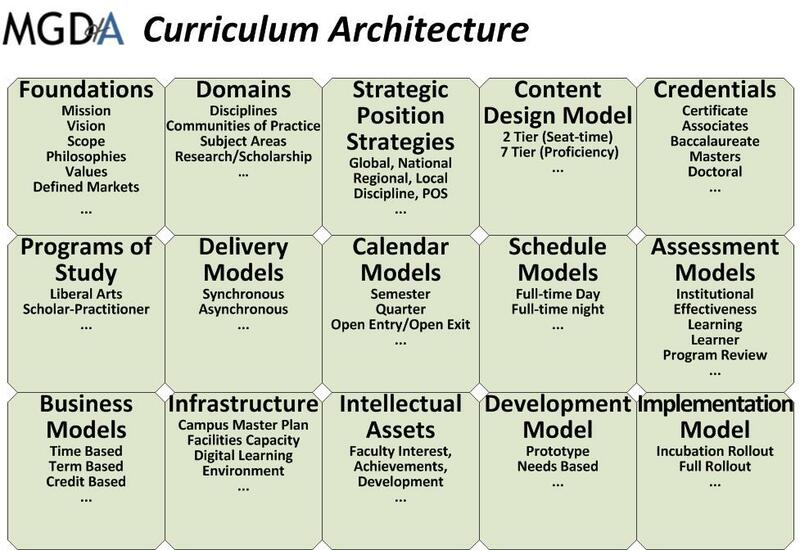 Put simply, the curriculum architecture synthesizes the many institution-specific design and delivery decisions inherent in curriculum management. The taxonomy of degrees, certificates, sequences, courses, modules, and learning objects within a school’s curriculum inventory defines the primary design feature of the school. This domain anchors the architecture, shifts attention to outcomes and program-based design elements, and, thereby, facilitates the alignment of the academic master planning process with other institutional processes. This domain details accrediting, licensing, and assessment oversight organizations, the units warranted, and related specifications. In doing so, the architecture incorporates the School’s accreditation and outcomes assessment planning processes. This domain tracks program term parameters, schedule model parameters, delivery modes, facilities implications and other delivery specifications. This domain specifies the human resource specifications, instructional and non-instructional funding, and other resource specifications required to deliver the curriculum. Enrollment funnels and flows, program course-of-study details, calendar and schedule model patterns, and support services link to the architecture to form a complete integrated portrait of the breadth and complexity of any education and training enterprise. A curriculum architecture specification table provides a framework for understanding, communicating, aligning and managing curriculum delivery. While the elements within curriculum architectures may be similar, curriculum architectures are institution-specific reflecting the many contexts, partnerships, and strategic decisions inherent in program delivery. Business Model Variables.The process of organizing these domains within a spreadsheet, and detailing the scope and specifications of each, yields a useful blueprint for understanding relationships between the structural domains; highlights the implications of decisions made within any one domain upon the other domains; illuminates constraints imposed by previous decisions or other realities; and begins the academic master planning process.